Kitchens and baths sell homes. But in the luxury New York City real estate market, it takes a lot more than that. Buyers expect the highest level of custom finishes in the top condominiums– and architects and developers are delivering. 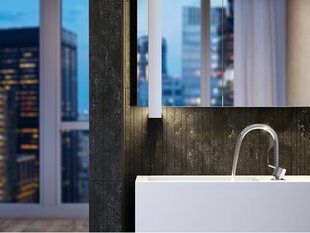 Renowned architects and designers like Sir David Adjaye, Piero Lissoni and Morris Adjmi have incorporated textured marble and stone into their lavish bathroom interiors. Traditionally, bathrooms are sleek spaces with flat walls and floors. Today, the most glamorous designs are rich and multidimensional with ridges, layers and vein-cut detailing. These kinds of details, which is beyond what is expected, evoke luxury and attention. The stone and marble used in these textural designs are rare and sourced from around the world. At 130 William, acclaimed architect Sir David Adjaye, who was knighted by Queen Elizabeth II and named one of TIME magazine’s 100 most influential people of 2017, has designed his first skyscraper and first high-rise tower in NYC. The master bathroom marble was hand selected from the Apuan Alps in Tuscany, Italy. 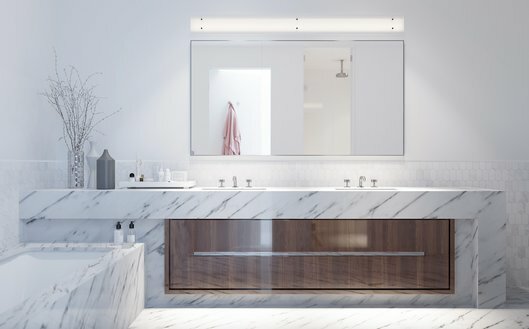 Elegant Salvatori textured Bianco Carrara Italian marble highlights the master bathrooms, which offer soaking tubs, spacious walk-in showers, custom Pedini Italian vanities and custom Adjaye designed illuminated medicine cabinets. 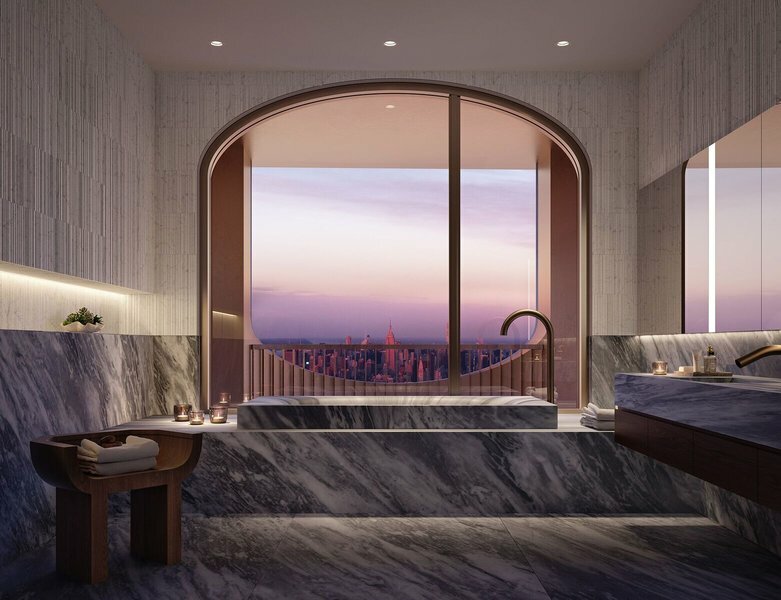 45 Park Place is the first New York development featuring Piero Lissoni’s interiors. Lissoni is one of modernism’s most sought-after international designers. 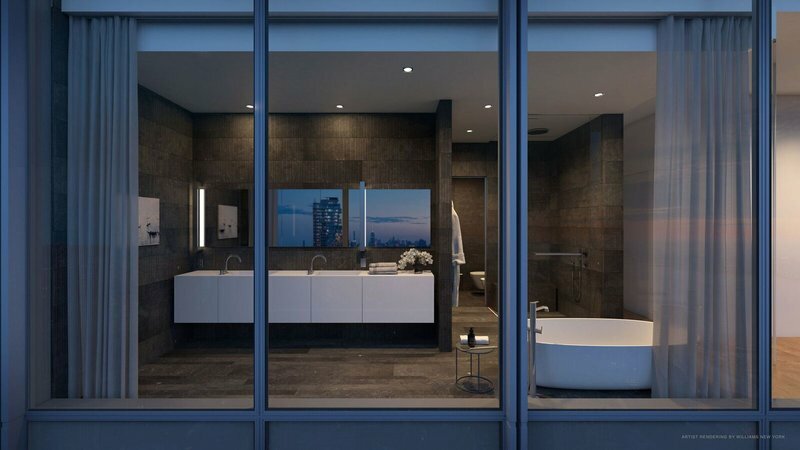 The master bath in this soaring glass tower, developed by Soho Properties with architecture by Michel Abboud of SOMA, boasts free-standing soaking tubs surrounded by walls clad in Italian textured Pietra d’Avola raw limestone, specifically designed by Lissoni for Salvatori. Lissoni also incorporated this textural element into the elegant windowed power rooms, which are clad in Silk Georgette stone. New York-based architect Morris Adjmi, who is known for respecting and evoking a neighborhood’s past while adding the beauty and desires of the present, implemented this design trend at 207W79, a development of Anbau that’s ideally located in the Landmarked District of the Upper West Side. 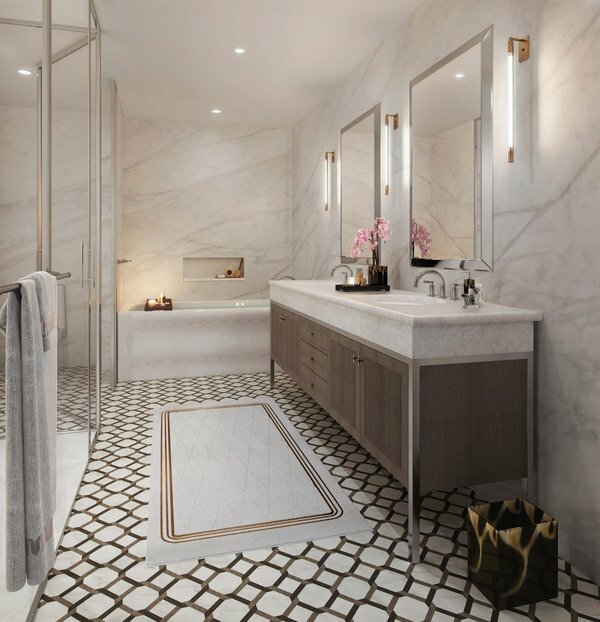 At the new handsome brick building, which combines the classic appeal of pre-war residences with the expansive spaces of modern loft-like living, the master bathrooms are tiled in an Empire-style rattan pattern in marble and porcelain. Secondary bathrooms are rich with textures, from hive tile Calacatta marble accent walls to Bianco Beatriz vein-cut walls and vanities. The state-of-the-art condominium conversion, by Brack Capital Real Estate, is located in Manhattan’s West Village. An Italian limestone extracted from an underground quarry on the northwest bank of Iseo Lake in Italy, called Ceppo di Gré, features in the building’s powder rooms. Leroy Street Studio went to Italy to source it from the quarry, which is currently the only quarry in which Ceppo is mined. Particularly beautiful and very durable, it has been used in Italian buildings for millennia. It is well-known for characteristics such as its blue-gray color and its distinctive pebble-marked surface that make it sought-after and very elegant. Leroy Street Studio created two-toned fixtures within the master bathrooms, which are studies in white, with honed Royal Danby marble. The Tribeca West Historic District’s latest loft condominium conversion is made up of five luxury apartments. With architecture and interiors by Meshberg Group, all of the master baths have exquisite marble finishes. 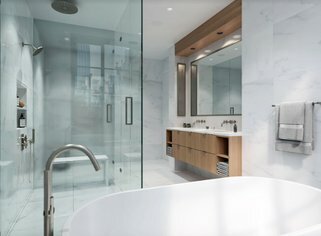 The penthouse duplex master bath has a glass-enclosed steam shower with a Calacatta Lincoln honed marble bench and a freestanding tub to further create a relaxing oasis. The 15 Jay sales launch is expected this fall (with MNS sales team). 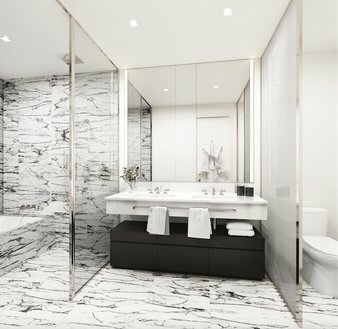 1000M, the luxury condominium coming to downtown Chicago, was designed by Chicago-native and interior design star Kara Mann. Mann curated a mix of natural stone options on the floors and walls, including the showers.